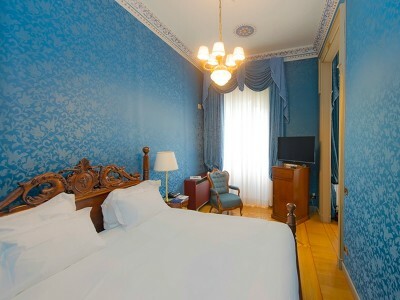 The hotel’s 14 rooms and suites are furnished with the glittering luxury of the 19th-century, and some feature Arabesque features in the windows and doors. Parquet flooring, en-suite marble bathrooms and period antiques give the rooms a sophisticated elegance. We particularly love the beds: topped with handmade mattresses, they're among some of the finest in the world. 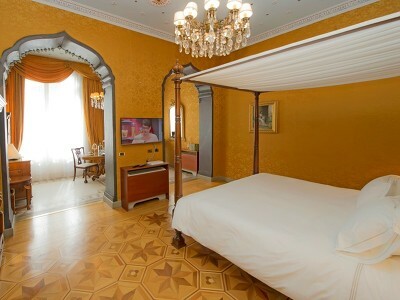 The four Classic rooms, sleeping two, are spacious and lies on the third floor of the villa. They feature walls covered in antique pink silk, a large double bed, and elegant parquet flooring. The marble bathrooms have a tub. The rooms on this floor are the only ones in the villa which have a small terrace with a table and armchairs and a glimpse of the lake. You will also find a table and chairs in the bedroom, ideal for reading or writing at, for relaxing over a snack or breakfast served in the room. The two deluxe rooms, sleeping three, are on the first and on the second floors of the villa. 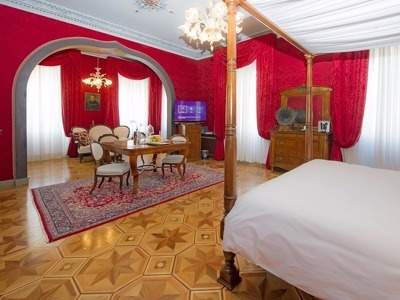 They feature red or gold silk walls and large double canopy bed with a superb parquet floor. The marble bathrooms have a shower and enjoys natural light. Overlooking the garden, the view is of the mature gardens and the lush countryside surrounding the villa. The table and chairs are ideal for a relaxing snack or breakfast in your room. An extra bed or cot can be added, on request, for our younger guests. The two Junior Suites, sleeping three, are on the first and on the second floor of the villa with royal blue wall-coverings. They are L-shaped with a large double bed and the possibility to add an extra bed. They have a magnificent parquet floor and the marble bathrooms have a shower and enjoys natural light. On crossing the threshold of these suites one enters a small antecamera from which one accesses the bedroom through the door opposite or the bathroom through the door on the right. The four windows on two sides of the suites ensure a light and airy interior and a fine view of the gardens . These suites are ideal for family stays thanks to its shape, the long side of the L being ideal for the positioning of a single bed. The two Executive Suites, sleeping up to three, are on the first and on the second floor of the villa. The gold-coloured wall coverings are a feature together with the large double canopy bed and magnificent parquet flooring. The elegant marble bathrooms have a large shower. South facing they enjoy a fine natural light which enters through the large windows of both the bedrooms and the bathrooms offering both a beautiful lake view and a view over the mature gardens surrounding the relais. The intricately decorated ceilings, doors and windows are arabesque in character following the style the whole villa was built in. In the suites, the typically Moorish arches make for an open division between the sleeping area and the sitting area, the latter having a coffee table and armchairs near the windows. An extra cotbed can be added on request. The two gold Master Suites, sleeping up to four, are on the first and in the second floor of the villa. The walls are covered in antique gold silk. 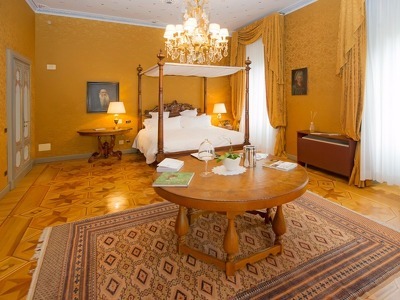 In both suites there is a large double canopy bed and magnificent parquet flooring. The marble bathrooms and the large showers are ideal for deep relaxation and regeneration. At sunset, when the sunlight reflects on the golden wall hangings, an atmosphere is created that is quite surreal, almost enchanted. The strong arabesque atmosphere of the Suites is due to two typically Moorish arches and the decorations on the ceilings. A lounge area in the suites is ideal for moments of relaxation and reading. Due to the spacious nature of the suites, it is ideal for stays for families and more than two people. It is possible to add an extra bed or cot on request. 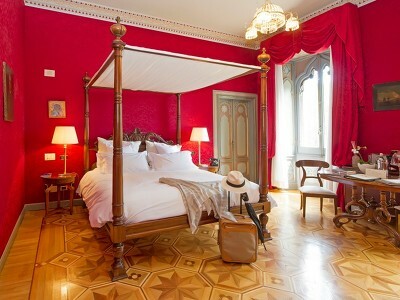 The two red Master Suites, sleeping up to four, are on the first and on the second floor of the villa. They both feature deep red silk wall coverings and a romantic atmosphere. At the entrance, before entering the suite itself, you access an anti-camera furnished with a console and mirror. 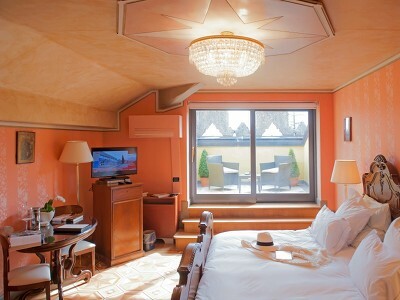 The suites have a large double canopy bed and magnificent parquet flooring. At the foot of the bed is a large table which is ideal for a romantic aperitif or breakfast. Lighting is soft and warm thanks to numerous lamps of various kinds and sizes. South-facing, the suites enjoy plenty of light throughout the day from the 5 large windows offering an enchanting view of the lake and the surrounding countryside. A large Moorish arch which is reminiscent of the style the villa is built in separates the sleeping area from the lounge area with its sofa and armchairs. Moorish inspiration for the villa is also to be seen in the decorations on ceiling, windows and doors. Due to its generous proportions, the red Master Suites are also perfect for families or more than two people staying and extra beds or cots can be added, on request. The marble bathroom are particularly well-lit thanks to a large window with plenty of natural light pouring through it. There is also a large shower. Nestled on the sleepy shores of Lake Orta in Piedmont, Villa Crespi has an enchanting Moorish design and a restaurant that has won worldwide acclaim. The 19th-century villa was inspired by Middle Eastern architecture, and the elegant intricacies of its décor have a dreamlike, otherworldly quality. The hotel’s luxurious hospitality is regularly singled out for awards, and Villa Crespi’s commitment to the wellness of their guests can be seen in the exclusive use of eco-friendly, hypoallergenic products. Villa Crespi is well-known to foodies from all corners of the globe for its restaurant. Under the auspices of Chef Antonino Cannavacciulo, the restaurant has been awarded two of the coveted Michelin stars. Chef Antonino himself is internationally recognised, both for his cooking and for his television appearances as a judge on Masterchef Italia. Whether you come to Villa Crespi seeking peace and tranquillity amidst this beautiful natural scenery, or you’re a proud gastronomer looking to tantalise your tastebuds, your stay here will be truly unforgettable. Pamper yourself at the hotel’s wellness centre, which offers Ayurvedic treatments and massages to soothe and relax. For those who find themselves inspired by Chef Antonino’s cooking, the hotel arranges cooking courses and experiences where you will learn the secrets behind the restaurant’s magical cooking. The hotel offers a wealth of activities to keep you entertained for the entirety of your stay, including a rather spirited excursion with a difference: a trip to the nearby grappa distillery, where you’ll learn how this traditional spirit is made and, of course, have the chance to taste. The hotel has an enchanting location on the banks of Lake Orta, and the charming village of Orta San Giulio is just a short walk away. The village is home to the Sacro Monte dedicated to St Francis of Assisi, a UNESCO heritage site and a real treasure-trove of Renaissance art. No visit would be complete without a trip to the beautiful Island of San Giulio on the lake, which abounds with myths and legends. Chef Antonino Cannavucciulo serves elegant meals that combine the traditional cooking of his Neapolitan upbringing with the flavours and ingredients of his adopted Piedmont, and his talents have brought Villa Crespi international acclaim as well as two Michelin stars. The menu is constantly shifting according to the season and what’s available, so every meal here will be a true culinary adventure. The degustation menus are a special highlight, and are undeniably atmospheric whether enjoyed in the sophisticated dining room or al fresco on the veranda. l'A8 (Milano-Laghi), l'A26 towards the Liguria coast and the A4 (Milano-Torino). If you prefer the train, the station of Orta Miasino can be reached from Milan or Turin, changing train at either Novara or Arona. You can also ask us to get you permission to land with your helicopter a short distance from Villa Crespi, we will come and pick you up from your landing place. The nearest airport is Milano Malpensa Airport, a 45-minute drive (Approximately 46.7km distance). Private transfer cost: Euro 120,00 per way for two people. If a cancellation is made on the day of arrival, or in the case of a no-show or early departure, 100% of the total price will be charged. If a cancellation is made within 4 days of the arrival date, 50% of the total price will be charged. Children of all ages are accepted. Babies from age 0 to age 2. Fee is $0 amount in hotel's currency. Children from age 3 to age 5. Fee is $46 amount in hotel's currency. Children from age 6 to age 11. Fee is $98 amount in hotel's currency. Children from age 12 to age 18. Fee is $130 amount in hotel's currency. I was an amazing experience, totally exceeded all our expectations. The staff couldn't be any more kind, friendly and professional. Everybody there, from the front desk to the chauffeur were willing to help and worried about every little detail. It really felt like home. A wonderful, comfortable, spotless home. Really like an Arabian fairy tail in the heart of Italy. Do not miss to make reservations at the restaurant, is not only food (which is superb) it is an experience! And then the surroundings? lake Orta, the little town and Saint Giulio island... I am still speechless. Truly a magical experience we shall never forget! The restaurant has a very warm and comfortable atmosphere and is welcoming and the staff are first class. In general, the food was good, especially the amuse bouches and post dessert pieces that were outstanding. However, I do have two points of criticism; the prawn ravioli appeared to have stood on a hot plate during preparation as the pasta was stuck to the plate and was hard round the edges; the second point of criticism is that the sauce with the lamb was too heavily salted. This was also the case with the sole chosen by my wife. The flavour of the raspberry and liquorice dessert was outstanding and visually it was a work of art. The wines recommended by the sommellier perfectly complemented the food. Delicious, beautifully presented food in a gorgeous setting. Attentive, friendly service. Loved our experience eating at Villa Crespi - including a tour of the kitchen at the end of the evening! Fabulous in just about everything. The only negative comment I feel needs to be made is that the mattresses in our room (214) need to be changed as one could feels they became "deformed" over time so the sleep wasn't of good quality.